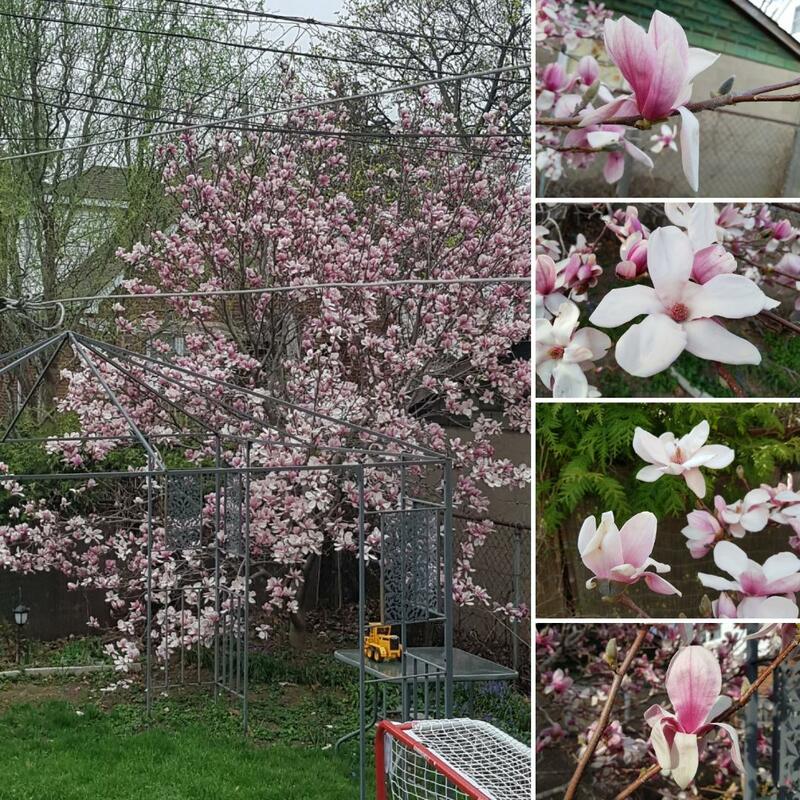 This is my magnolia tree. I LOVE this tree. I have chased children away from it with swinging bats and hockey sticks, and I have chased squirrels out of it after watching them chew the buds and flowers off. I have even cut vines away from strangling the delicate branches. I have so many memories tied to this tree…I protect it like a child. Before my parents moved out of the house I grew up in from the age of 7, my husband and I raided their garden for some of my favourite flowers and a couple of trees. This magnificent magnolia was one of our rescues. And it is a miracle that it survived the transfer. It was much smaller, but we still didn’t get as much of the root ball as the books recommended because it was so heavy. We drove 2.5 hours with it on a trailer, exposed to the elements. And then we transplanted it into our back yard, and prayed for it to grow new roots. Someone had told me to put banana peels in the hole with the roots, so I did. Actually, I believe I froze whole bananas and cut them up as we replanted this tree. The first spring, there were no buds, and no flowers…or very few…and I was worried we had killed it. But leaves grew, and it filled out over the course of that first year. And ever since we have had an amazing display of blooms every spring. Every time it blooms, it reminds me of my mother. She LOVED this tree, and wanted one for many years, finally purchasing this one with her accident settlement money. My father built her the garden of her dreams. And they would sit together in the back yard, and admire the beauty that surrounded them. A few years after we acquired this tree, my mother passed away. While she was alive, I would call her and update her on the tree and it’s blooms, and post pictures on facebook for her to see. Since her passing, I spend time with the magnolia as though it were her resting place. I even talk to the tree, and my mother. Yep. I admit it. There is something you didn’t know about me. 😉 This tree brings me peace and calm in the busy-ness of life. It reminds me to grow, and bloom, and be myself. And it comforts me. It is a family heirloom that I hope to have for many more years to come. Do you have a favourite tree or flower? For sentimental reasons? Or just because it makes you happy? Tell me about it!